The 1940’s tower over every other decade of the 20th century as the most full of sorrow, patriotism and ultimately – hope. It was a time of war and sacrifice, were people joined together to get through the hardest of circumstances. Dame Vera Lynn has always been an idol of mine, widely known as “the Forces’ Sweetheart”, she entertained the troupes and kept spirits high during the darkest of days. I was so excited to shoot my 40’s look and pay homage to not only Dame Vera but to all of the service men and women who fought in the war. Before I go on with the post I just wanted to say a big thank you, this series has been (by far) my favourite ever to create and the support you’ve shown be on here and over on my Instagram really does mean the world. The hours upon hours of location and styling research is all worth it. A particular shout-out to my Photographer Zoe, she’s really pushed the boat out on this one and delivered some of my favourite pictures to date. A series like this takes a whole lot of time and planning and to know I have someone whose just as excited to create the content as much as I am is a dream come true. Zoe, I couldn’t do it without you! Now, let’s get to it. 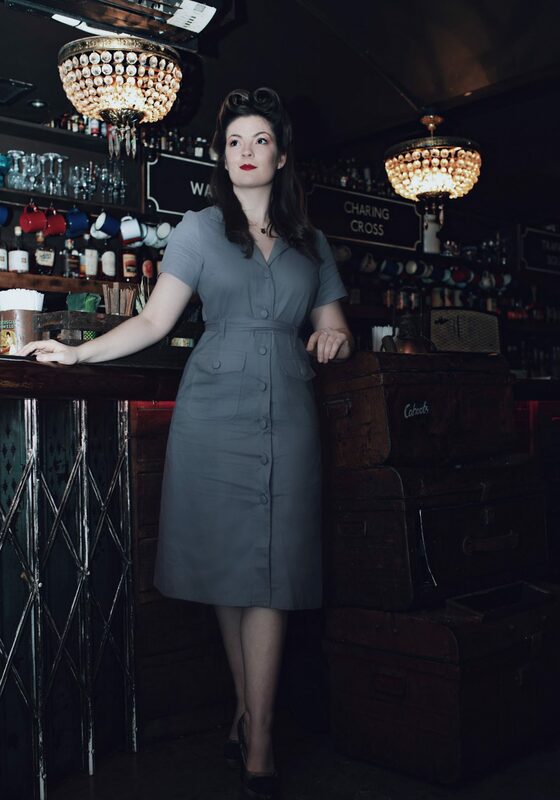 For my 1940’s post I wanted to go all out with the styling, again preferring not to go down the costume shop route I found this dress on ASOS and thought it fit the era perfectly. 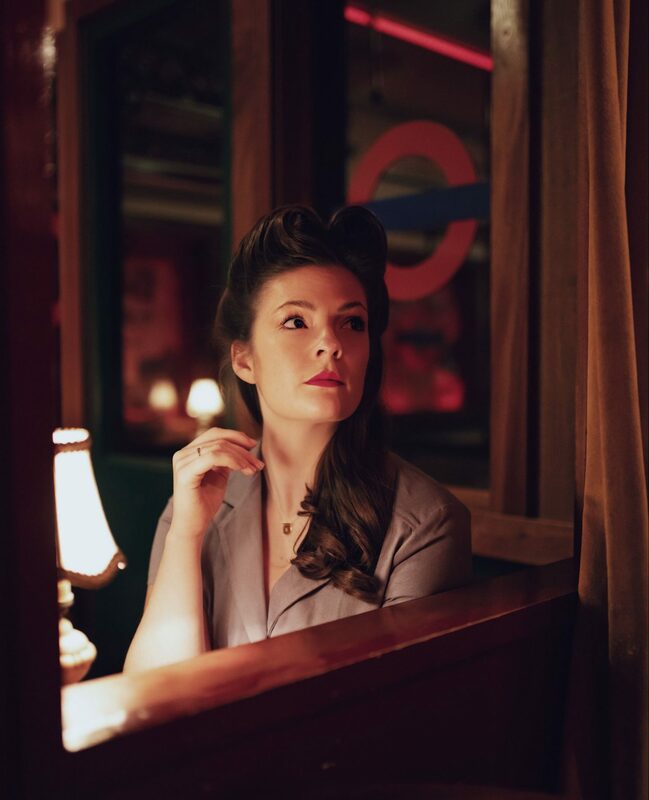 I had researched 40’s hair styles in depth but I kept on returning to the iconic victory rolls and knew it was the way I wanted to go pretty early on, however… no way would I be able to create the look myself! 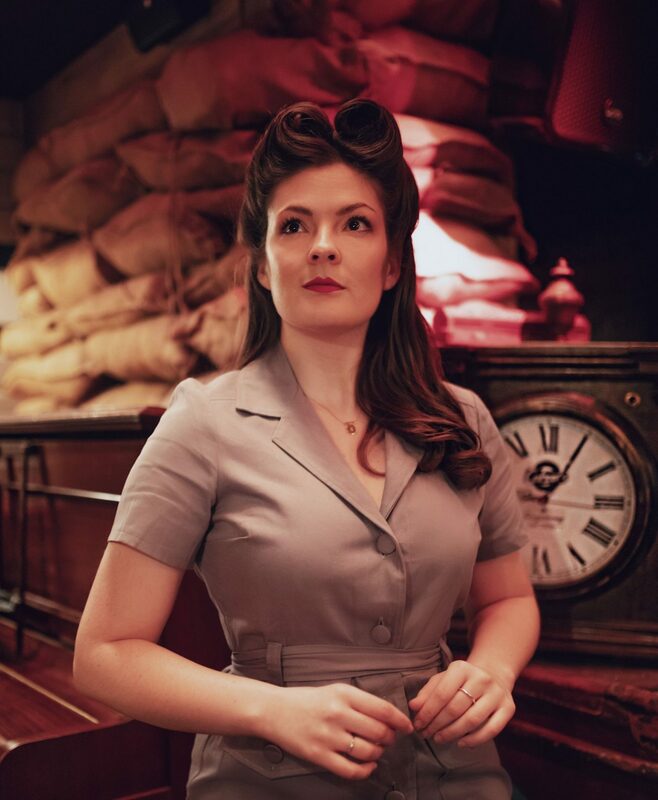 The amazing team at Duck & Dry once again offered to style my hair for the shoot and thanks to the wonderful Alan Kitrell my victory roll dream came to life. I can’t describe how happy I was with the final result, it really did finish off the look perfectly. 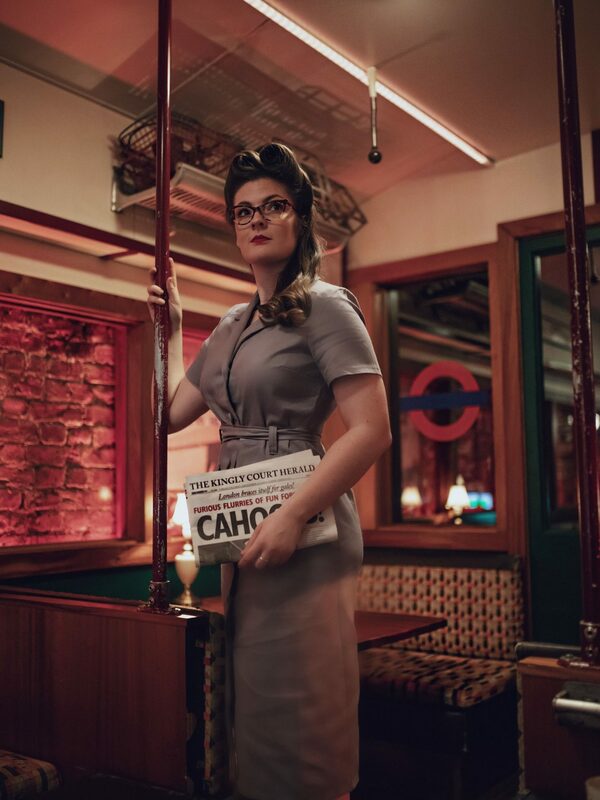 As for location, there was one place in particular I had in mind – Cahoots! Cahoots is a cocktail bar in soho and one I’ve been to a couple of times in the past. 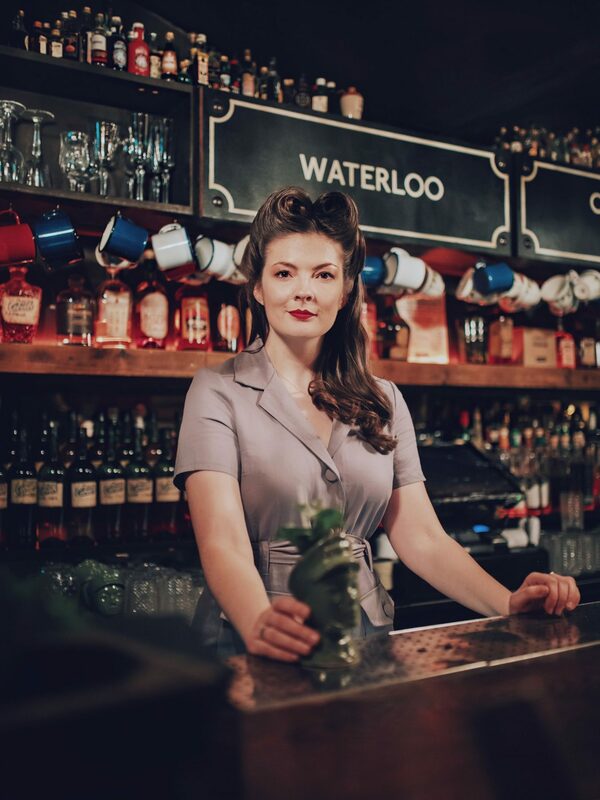 It’s a 1940’s blitz themed bar based underground in Kingly Court, The decor is heavenly, a war-time tube station with secret little cubbies and authentic details. I emailed on a whim thinking they’d never let me shoot there but I was welcomed by the team with open arms. They’d seen my previous Decades posts and thought it was a great idea so off Zoe and I went, once again back in time to visit war-time Britain. World War Two finally came to an end in 1945 but still today their are troupes fighting and losing their lives to war all over the world. Lest we forget. I hope you enjoyed this little adventure to the past. The 1940’s was a decade that changed the world forever and one I hope I did it justice. 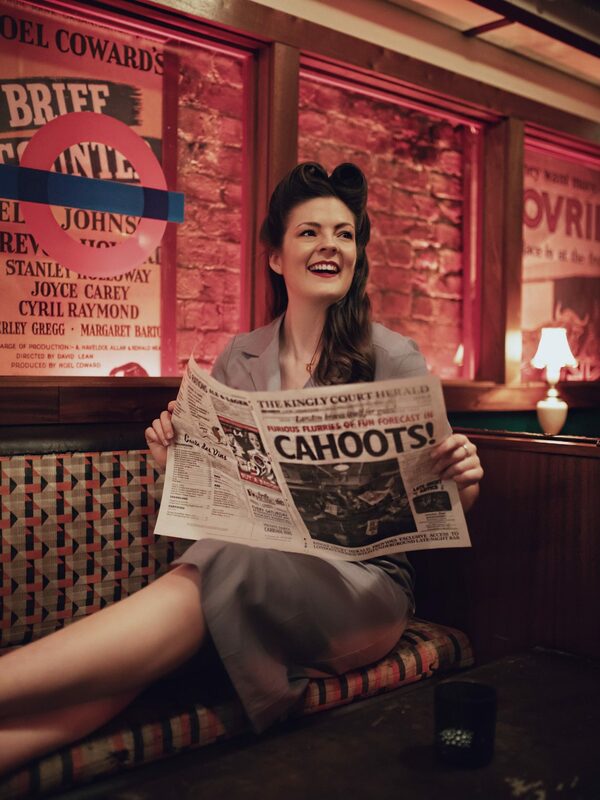 I’d love to hear your thoughts, are you a fan of the vintage hair styles, would you give it a go? Let me know what Decade you’d like to see me do next and which has been your favourite so far. Thank you so much for taking the time to stop by, I appreciate your support more than you know. Remember you can keep up to date with my daily goings on over on Instagram and be sure to check out my travels over on my Youtube channel. For now it’s time to head back to present day but I’ll be back taking another journey to the past very soon! Those women are so inspiring! Loved this post! I feel like I could do so much more! Feel empowered!